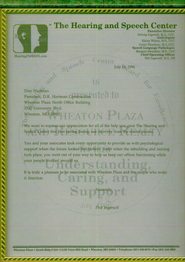 We want to express our appreciation for all of the help you gave The Hearing and Speech Center this past spring during our recovery from the winter storms. Barb and I wanted to express our personal thanks to you for coming to Vermont and serving us at The Fold. Your hard work and sacrifice made the projects at the South Wheelock Boys Home, McGoff Hill Girls Home, and Counseling Center a great success. Many individuals including parents have expressed positive feed back to Barb and I. Everyone that has seen what was accomplished is amazed at all that was done. We are very thankful for your efforts and hope that you will return again as part of a future work team. 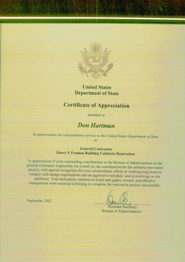 United States Department of State Certificate of Appreciation awarded to Don Hartman in appreciation for extraordinary service to the United States Department of State as General Contractor for the Harry S Truman Building Cafeteria Renovation. for the Bureau of Administration. 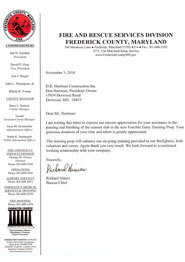 I am writing this letter to express our sincere appreciation for your assistance in the pouring and finishing of the cement slab in the new Forcible Entry Training Prop. Your generous donation of your time and talent is greatly appreciated. This training prop will enhance our on-going training provided to our firefighters, both volunteer and career. Again thank you very much. We look forward to a continued working relationship with your company. Thank you so much for the extraordinary efforts you expended to ensure my wallet was safely returned to me. I truly appreciate your acts of kindness by searching for me in two near-by restaurants and then driving to my residence to deliver my wallet that evening. The beaver skin wallet would have been difficult to replace since my husband purchased it during a once-in-a-lifetime hunting trip to Canada. Additionally, you saved me the time, aggravation and expense to replace my driver’s license and cancel all my credit cards. I am grateful for your thoughtfulness and honesty. Don Hartman, you’re a Good Samaritan and the story of the occurrence was retold to my Sunday School class, as well as my family and friends. 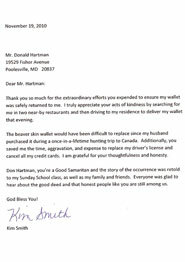 Everyone was glad to hear about the good deed and that honest people like you are still among us. I cannot say enough good things about Don and his sons, in all my years working with contractors hands down he is the best. The professional attitude, and superior quality of work make working with him a pleasure. He has great ideas and innovative solutions and he took our dream house and made it a reality. Any requests we had he researched and found the best and highest quality product and his knowledge of construction, code and architectural parameters made the whole process so much less work for my husband and I. His employees are all courteous, and trustworthy; his sons supervised all sub contractors, and this made us feel comfortable trust wise. I will always use Don for any future projects; and just yesterday, I had a tiny leak in one of our bathrooms, Don came right over and fixed it. It is very hard nowadays to find someone like the Hartman family that treat your project like it was their own home and go out of their way to make sure you are happy with the finished product. I can tell you that you will be more than satisfied when your project is completed and will totally agree with my assessment of Hartman Construction. I honestly have nothing but great things to say about Don Hartman. We had a major kitchen renovation completed last year that included going out the back of the house about 15 feet and nearly twice as wide. In order to be that wide and have no pillars in my kitchen holding up the second floor of my home, this exterior wall that we bumped through needed to be supported. Don was extremely accommodating with what my wife and I wanted. He poured over the plans, had a structural engineer come out twice and used the best materials available for the support beam to get the job done. 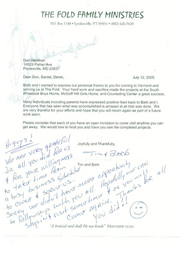 This is one example of dozens that Don helped us with throughout the large project. The completed work is nothing but incredible. His attention to the big ticket items like the support beam was only matched by his attention to the small details. He is a perfectionist. I am on the verge of having a smaller project completed in the house this Fall and I would only consider Don for the job. I don’t feel that I could find another contractor that would be as honest, hard working and great at what he does.